Fisherman’s wharf (I was there, but if you want to have a decent look around you need to leave enough time to do so! I believe a lot of tourist families choses to stay in accommodations around here rather than downtown – for a good reason). However, I chose to spend my last day here joining a friend and his friends on a roadtrip to Big Sur. After much car karaoke and three hours on the highway, we arrived to this beautiful coastal national park. I would like to tell you more about the trek opportunities, but to be honest we only walked to an observation point and camped with our picnic stuff. To put it this way; we drove in total a 6 hours to sit down and enjoy the view. It was totally worth it. I can only imagine how the rest of the park must be like! 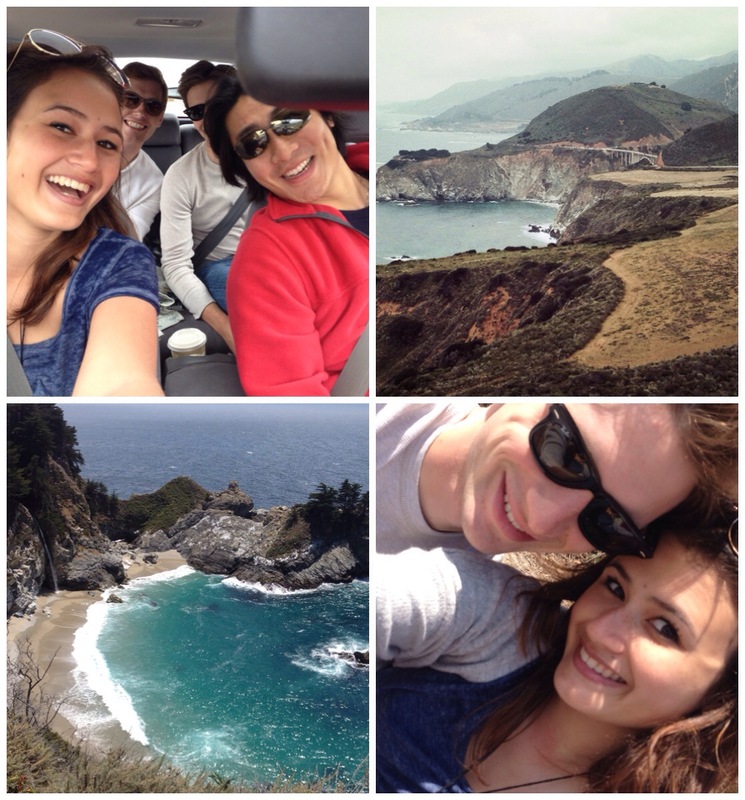 If you ever get the chance, check it out and let me know how you experienced Big Sur! Because I wanted to see a lot more of the californian coastline, I booked a ticket with the Amtrak Coastal Starlight trip. The train is over a $100 as opposed to the $30ish bus ticket and takes a good 4ish hours more. 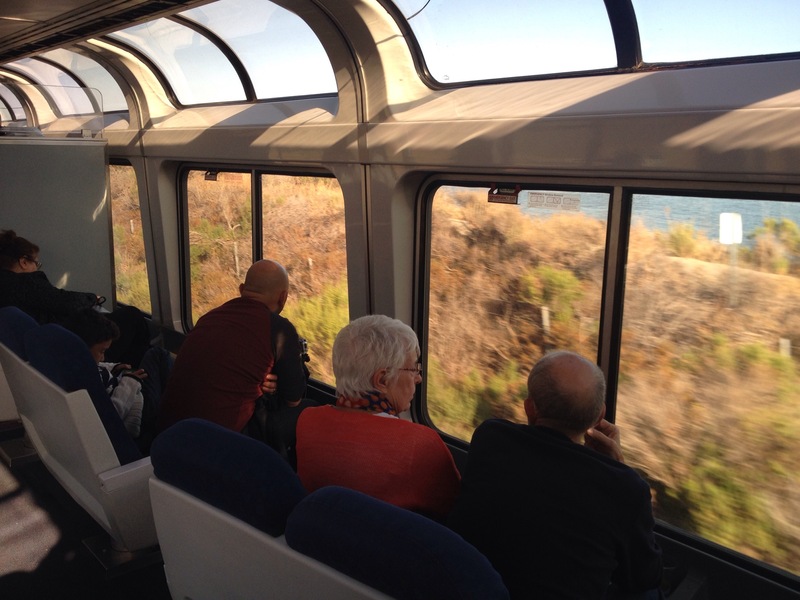 Stating that it follows the coast, but with quite a few contradicting reviews, I simply found the Amtrak train to be an experience to be had. The reviews weren’t wrong. It was not worth the money. I mean, apart from meeting my fabulous travel companion for the journey, I would say those money could have been so much better spent somewhere else. Fact is you only go by a small section of the coast and unlucky for us we only arrived to this bit when dinner was announced and we lost our seats which we’d been holding for 3/4 of the trip (while waiting for the coastal view). The train have seats carriages and then a scenic carriage with (limited) chairs turned towards the windows and a snack bar. The man serving the snack bar was probably the only staff which made this train ride worth it because of his many jokes and light humour over the speaker. What absolutely outraged me, however, was the demonstration of power shown by the seating lady in the dinner carriage. We came in for our dinner (having just boarded the train after breakfast we were quite hungry) and asked politely if we could please sit on the coastal window side. The lady pointed on the opposite side abruptly and we had no choice but to be seated there. Two groups before us had been placed on the coastal side and all the groups coming after us were as well. By the time dinner was served, we were still the only group placed on the other side and there were still available tables on the coastal side. I had to watch photo opportunity after photo opportunity roll by. Even worse, once we finally managed to swallow our not-too-great, overly priced steak and run back to the scenic carriage, our old seats were taken and we missed most of the scenic route besides the bit between the last two stops of the trip. 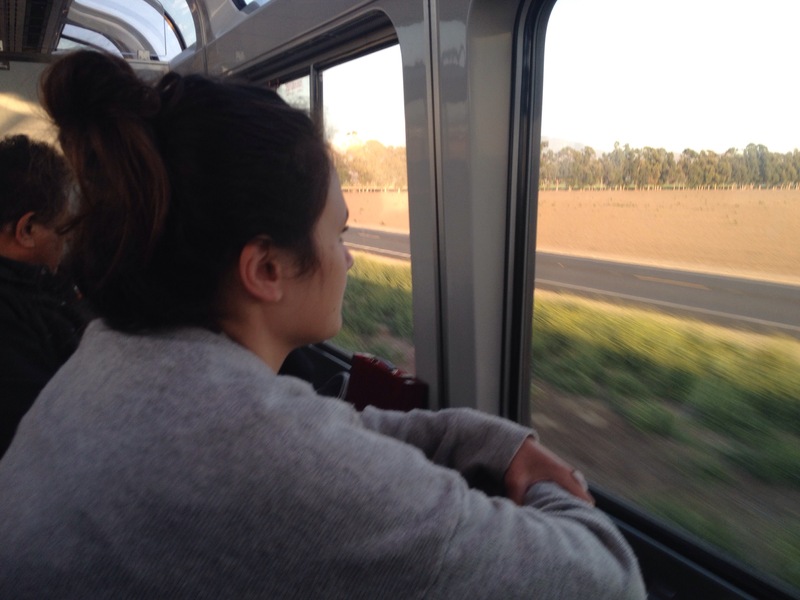 It’s pretty safe to say I was extremely disappointed in Amtrak’s coast starlight after this. It felt like we had paid a ridiculous amount of money to be treated like trash and starved to the point we had to spend even more money on food which wasn’t worth it (pack your own food and bring it on the train before you even arrive to the train station). There is so much with this train that could have been done better and which really should have been done better considering the coast starlight is not the only nor the cheapest transportation opportunity between SF and LA. Improving customer service would be a first – and they only need to look to their snack bar personale (serving SF-LA on the 24th of May 2015) for a great example on how the job should be done. I won’t say see you again Coast Starlight, I’ll be waiting for the speedy train like everyone else. I found San Francisco to be quite overrated and underwhelming. Particularly downtown ruined my impression of the town. The town is (for some reason beyond me) now more expensive than New York and the number of homeless people is outrageous. Considering it was a town I sometimes dreamed about moving to, it’s now a town I’m not in any particular hurry to return to.